Clematis ‘Red Passion’ (Clematis 'Red Passion'): growing, planting, caring. 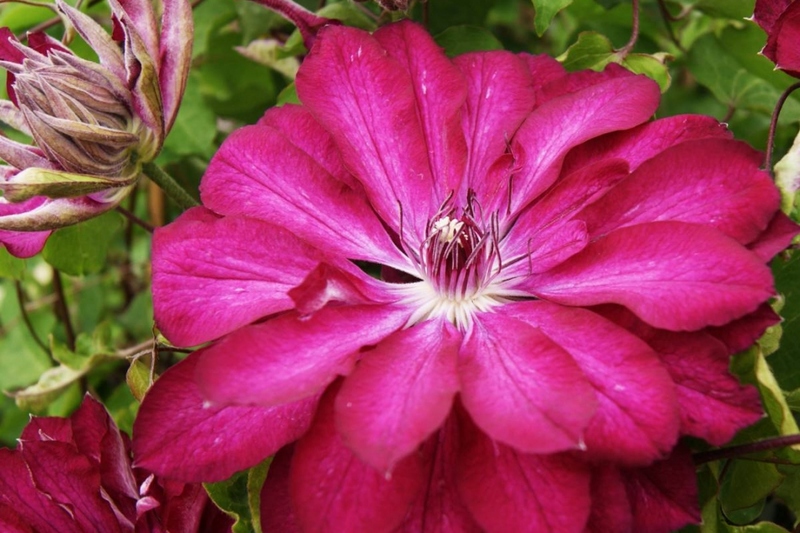 A Dutch clematis, with double large raspberry-coloured flowers. Clematis are a genus in the Ranunculaceae family, which includes approximately 30 species of woody, herbaceous perennials, as well as a number of semi-woody, climbing plants that may be deciduous or evergreen. They're cultivated for their abundant, decorative blooms! There are more than 40 cultivars, and due to the diversity of species, the appearance of clematis' varies considerably. Groww distinguishes between 3 types of clematis cultivars, based on pruning needs. This description concerns spring flowering clematis — called "group 2" — which that bloom from May to July on side shoots of the previous year's stems, and from July to August on the new year's stems. It's best to plant it at the end of autumn or in winter, in thawed soil, during the plant's dormant period. Plant in a hole at least two times bigger than the root ball. Spray water on the roots before planting. This will greatly improve the chances of growth, no matter the conditions. Form a basin around the plant's base, which will be used for watering the first months. Tamp the soil well around the roots (don't hesitate to use all of your weight). Water until the planting basin is full (at least two watering cans). Large, spring-flowering clematis prefer shade, which can be provided by a flat piece of tile, for example. Cover the base of the plant with a small mound of earth, which will encourage sprouts to emerge from the root. Provide your clematis with a small stake to guide it towards it's permanent support. Make sure you have a substantial and stury support, as clematis easily reaches 5 m of height even with regular pruning. Remove any weak, damaged or dead branches in March, and cut back other branches just above well-developed buds. Get rid of wilted flowers. Mulch climbing clematis in order to limit evaporation and competition with weeds. A 5-10 cm bed of wood or bark chip mulch is recommended.